Utah's Only Model Railroad Themed Family Entertainment Destination. With almost 10,000 square of feet of wild west themed space all under one roof, there's a lot to see and do at The Train Shoppe! Things get a little spooky at Halloween and transform into the North Pole in November for Christmas. Ever wanted to take a ride inside a model railroad layout? Well now that twilight has fallen over the sleepy town of Salty Gulch, and the mining operations have ended for the day, you can! This 5 minute long 1/8" scale train ride features themed scenes, synchronized lighting and audio, and an interactive shooting gallery that is fun for both kids and adults! Take time to operate the interactive garden railroad with four unique trains. Blow the whistle, toot the horn and turn the lights on and off as it goes around the track! Also be sure to check out the miniature structures, scenery, vehicles and figures that populate this miniature railroad! 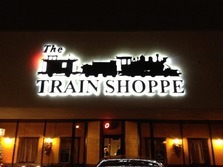 HALLOWEEN TRAIN RIDES: As summer gives way to fall, the Train Shoppe gets transformed into a spookier version of itself. Be sure to check out our resident trio of pumpkins as they sing along to some of your favorite Halloween classics, and beware of the lightning and thunder storms. And of course no Halloween season would be complete in the town of Salty Gulch without a haunted train ride. So for those brave enough, the Salty Gulch Railroad beckons riders to adventure into the foggy night air to help dispatch all sorts of ghoulish creatures that have taken up residence in the ride. Be sure to check the calendar for the days and times the train ride is running, and remember kids who come in costume only pay half price on October 31st!